When you have a cavity, it is imperative to have it corrected to prevent further damage to your teeth. However, many people often hem and haw about how their teeth will look once your local Cary or Holly Springs dentist puts in the fillings. However, those days are long past now. With tooth-colored fillings, it will be nearly impossible to tell that you have fillings at all, maintaining your beautiful smile. In the past, when a patient needed a filling, the dentist would use an amalgam of mercury and metal alloy to fill in cavities. While this amalgam was and still is perfectly safe, it looks unnatural on teeth as it is a dull metal strip on otherwise white or yellow teeth (depending on the dental hygiene of the recipient). While dental amalgam still exists, there is a new option on the market: tooth-colored fillings. Tooth-colored fillings are usually made with composite resin that looks much more similar to the enamel on the exterior of a tooth than does dental amalgam. This means that even though both the dental amalgam and the tooth-colored resin filling both fulfill the same purpose, the tooth-colored filling is nearly invisible if properly cared for. Just like any other dental procedure where there are multiple treatment options available, tooth-colored fillings have certain advantages and disadvantages when compared to dental amalgam. Toughness: Tooth-colored fillings can be stained or degraded by food and drink such as alcohol, coffee, curry, etc. The resin can also be eroded by prolonged exposure to alcohol. 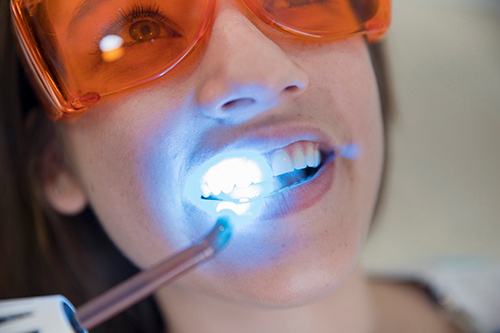 If you need a cavity filled and prefer the look of tooth-colored fillings, we’re here to help. Contact Sninski & Schmitt at one of our two convenient locations: Holly Springs (919-600-6262 ) or Cary (919-467-2203), or fill out our online form to schedule an appointment!